My vacation is coming to a close but it has been a fun week of my Best Bloggy Friends, right? I have one more to share. Cassie of Primitive and Proper. Take it away, Cassie! Hello 3 Sun Kissed Boy Fans! I am Cassie from Primitive & Proper. 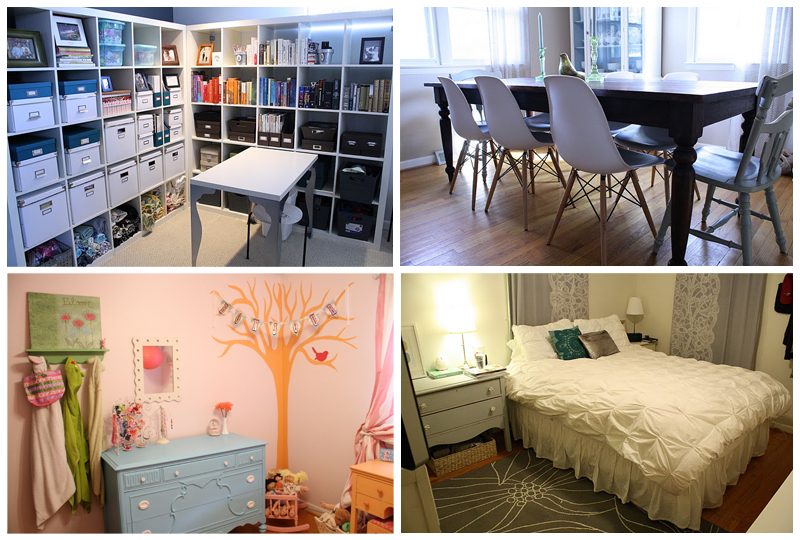 My blog mainly features furniture makeovers and tips, my own home's decor and design, and a little craftiness. I am so excited that Yanet has asked me to be a guest today. She is one of the warmest bloggers out there, as you all know... a genuine and kind soul. One of my favorite features that Yanet does is her famous, "You're Throwing WHAT Away?!?!?" It's really amazing what people will throw out or leave as trash. In light of that, I thought I would share some of my favorite sloppy seconds... a couple pieces I have found left behind on the ground at the auction, headed to the garbage. I head out to the Eastern shore of MD every now and again for Dixon's auction. I always come home with a truckload full of goodies! One time, I found this piece of wood... not really sure what it was but I thought it was cool. I took it home with me and created a "Beach" sign, painting it out in white, and stenciling on big letters in blue. I intended to sell it, but I just couldn't. I loved it too much, so it has been in my home since! Another lucky day at the auction, I found these two lyre back chairs homeless. Lucky for them, I saved them from ultimate demise and brought them home. 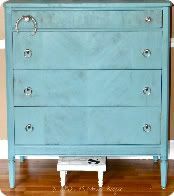 The beauty of free finds is that they allow you an opportunity to do something funky, and no loss if it doesn't work out, right? I painted them with Annie Sloan's Greek Blue chalk paint, and covered the seats with chocolate zebra fabric and here they are now! Some of my pals also hit the auction and come home with lucky free finds. My pal Pam found this awesome vintage owl bank left behind on the ground there. Say what? She knew of my fondness for owls and brought this cute little guy home for me. I gave him a little makeover with some spray paint, and now he looks like this and I love him! Yanet, thank you so much for letting me crash your blog for the day and share my own sloppy seconds! I hope you will come pay a visit to me at my blog. Just click the button and meet me there! Yep, pretty silly what people throw away. I love that BEACH sign! What a great idea, Cassie. Thank you so much for coming by. Cassie has a wonderful heart and is so talented! Great combination, don't you think? 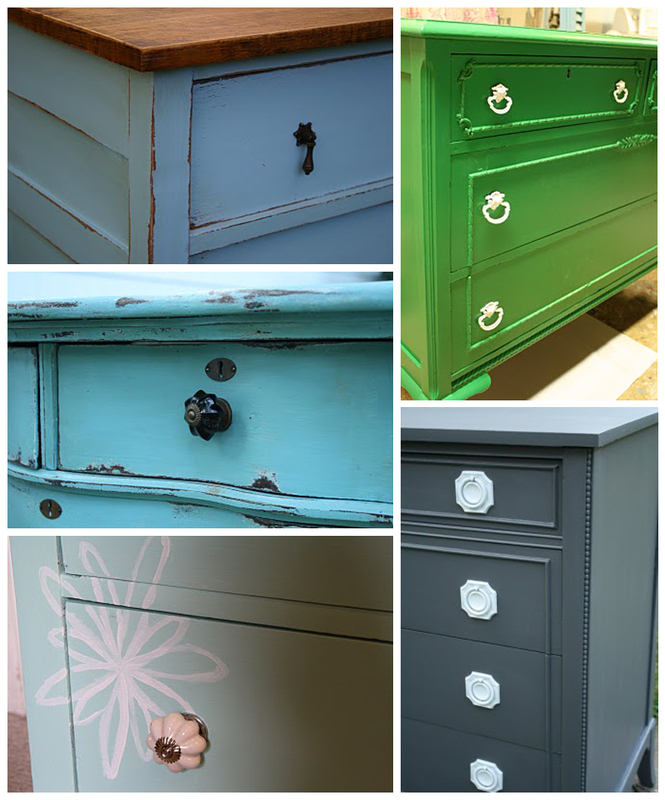 These are some of my favorite dressers she's refinished. I love their colors. Click here for the details. She has also been working on revamping her house. It is actually up for sale. Click here for the home tour. Wanna know what else she works hard on? Her abs! She's hot! Thank you once again, my Best Bloggy Friends, for hanging out with the 3 Sun Kissed Boys this week. You all have touched my life in one way or another and I am so glad we've "met". I'm going to let yall go now before I start hearing some sappy Disney song in the background. I look forward to coming back Monday with some of our vacation adventures. Have a happy weekend, everybody! 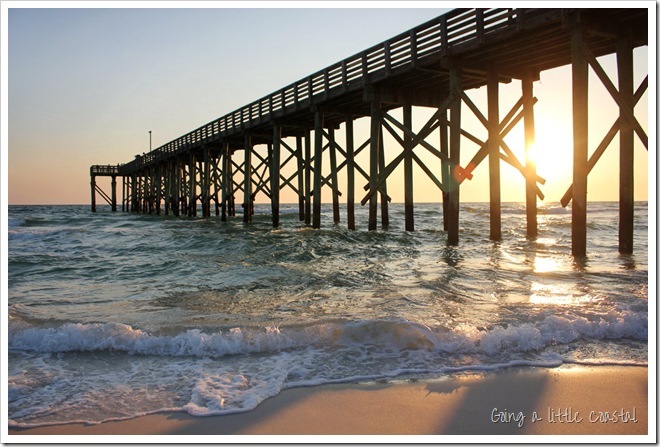 Today's Best Bloggy Friend is Anita of Going a Little Coastal. Anita actually lives IN Florida. I just know that in a not so distant future, I'm going to meet up with her and go junkin' AND drikin', but not drivin', of course. Tell us what refreshing libation you got for us today, Anita? Hi everyone! I’m Anita from Going a Little Coastal. I’m so happy to be here at 3 Sun Kissed Boys while Yanet is on vacation. I have 3 boys also so I know what it’s like to have a house full of testosterone. I thought it would be fun to share a great summertime drink. I had a bunch of limes I needed to use up and some fresh mint that grows like a weed. What’s a girl to do? They are very easy to make. I looked up the recipe online and adjusted it to fit my taste. I used less sugar, so feel free to adjust. I put the mint and sugar in the glass and then used the muddler to smash the leaves. This one is basically a pestle. Some are flatter on the bottom. The sugar helps to break down the mint and release the oils. Also, you should play the Bacardi Mojito song while doing this. It’s just more fun that way. Then I squeezed the juice from one lime into the glass and left half of it in there. Add the rum. I sadly do not have a crushed ice setting on my icemaker. Big mistake on my part not realizing that when I picked out the refrigerator. So I do it old school with my mallet. Just put the ice in a freezer bag and use the flat side of the mallet! Not the pokey side which I’m showing you. You don’t have to use crushed ice, I just like it. Fill the glass with ice and then top it off with club soda. It’s best to have the soda cold so it doesn’t melt the ice. If you don’t like the mint floating in your glass you can strain it. Or make it in a cocktail shaker if you have one. Then just add a few whole leaves for garnish. I don’t mind the bits in it. They are very yummy and so refreshing on a hot summer day. Anita, if I drink one of these, will I look like the girl in white dancing in the video? No? But if yall drink a few of these, I might look like her to YOU! Let me show off Anita's doings. 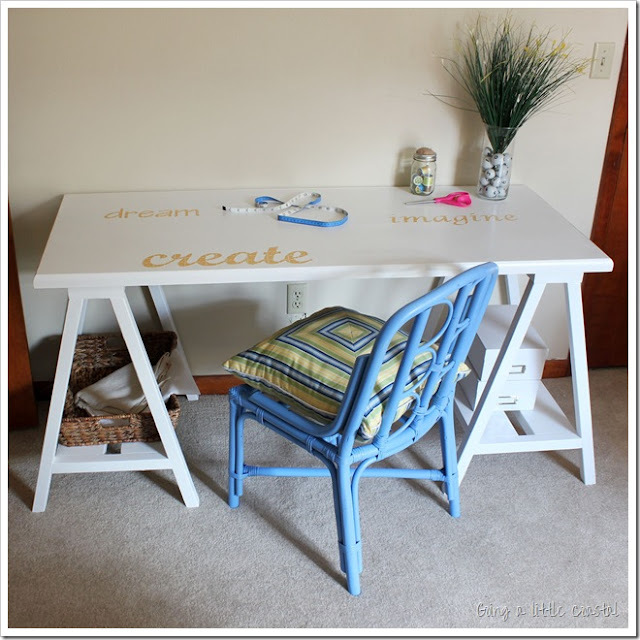 She MADE this sewing table. Gotta love a girl not afraid of power tools. This is her laundry room re-do. It might actually make me want to do laundry... or relax with a mojito, whichever. She loves the beach as much as I do. I always enjoy her beautiful beachy photos. Ok, you get the picture, Anita's great! Now go to her blog and play. I am so thankful to my Best Bloggy Friends this week for keeping yall entertained while I spend some (electronically-free) time with my family. Ok, almost electronically free. 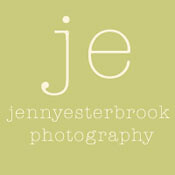 I can't help but post pictures on the 3 Sun Kissed Boys Facebook page and check my e-mails with your comments. They make me happy. Speaking of happy, Suzanne from Meridian Road just cracks me up in her posts and her e-mails. Here she is turning trash to treasure! Hi! I'm Suzanne from Meridian Road, and Yanet asked me to come over to her place to play today. I'm so excited to be here in Florida! Since I live in rural America, I thought it would be a snap to find some real laying boxes. No such luck. I did, however, find this at a thrift store. 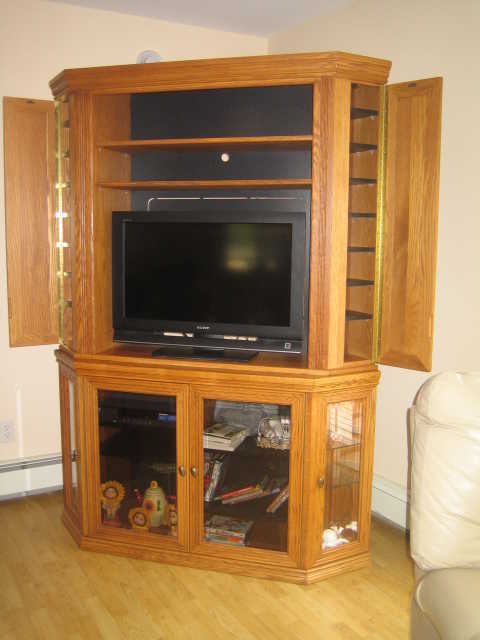 If I had to guess, I think it might have belonged to something like the lovely TV cabinet shown below and held VHS tapes in a former life. But I'm not sure. I bought it and went to work. I cut some boards to size, and screwed them in place. Pilot holes are a must. I really hate it when wood splits on me. So then I had this. After some paint and some sanding, we have this. My faux nesting boxes! Which I love from every angle! I've been collecting these little numbered tags for years. What I really love? They help keep my workspace clear so I can actually work on it! Thanks for reading, and thank you, Yanet, for letting me come to your house to play today! How COOL is that?! 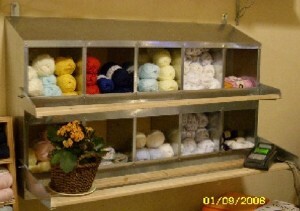 Thank you, Suzanne, for sharing this cubby with us. You know what I remembered? When Sun Kissed Husband and I first met, he lived on a street called Meridian Road! Weird, huh? So, you liked what Suzanne whipped up? Well, then, you're gonna like this hotel inspired key rack too. Oh and this chicken crate turned coffee table (the woman has a thing for chickens if you ask me). 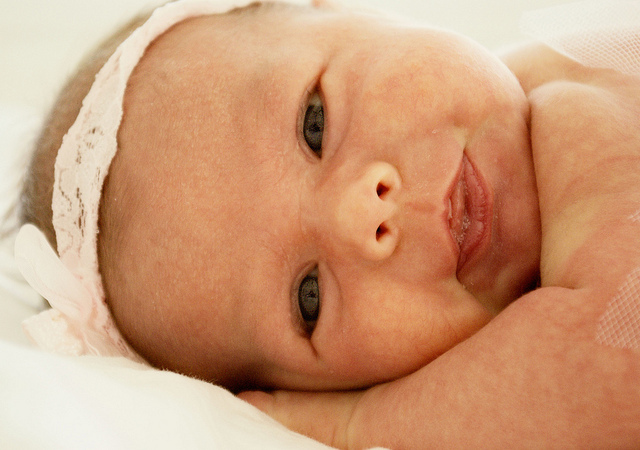 And just because her first granddaughter is just absolutely adorable, you have to go here and congratulate her. Tomorrow is Thursday. Close enough to Friday's happy hour. Join us for a a tropical drink! 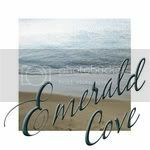 A week with my Best Bloggy Friends continues today with Michelle from Emerald Cove! I am Michelle from Emerald Cove and I am so happy to be here today to guest post for Yanet! Today, I want to show you how my daughter and I made a beachy mobile using driftwood, starfish and some Dollar Store hemp string. I am showing you the after first so you can get an idea as I take you through the steps that we did. Here are the supplies that we already had so this cost me nothing!! 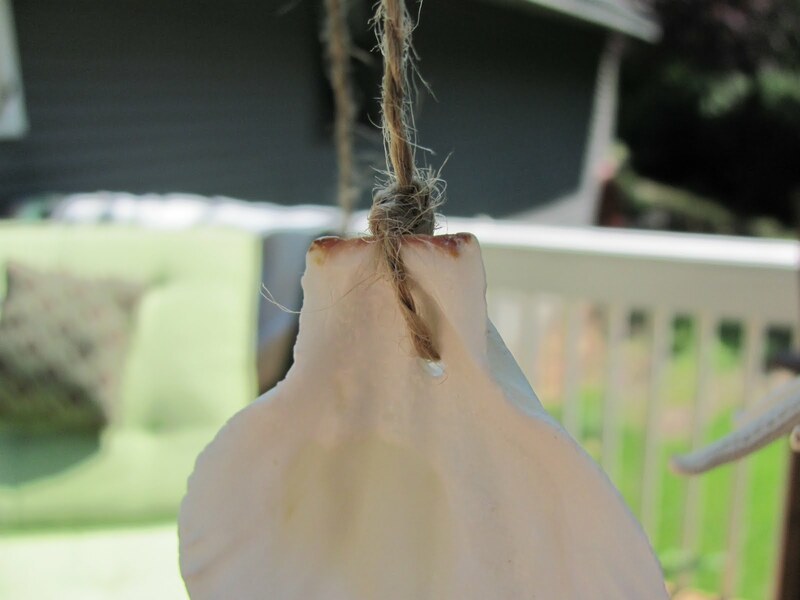 We started by drilling a hole in a medium size driftwood that would be the top of the mobile. We threaded the string and tied it off so it would stay in place. 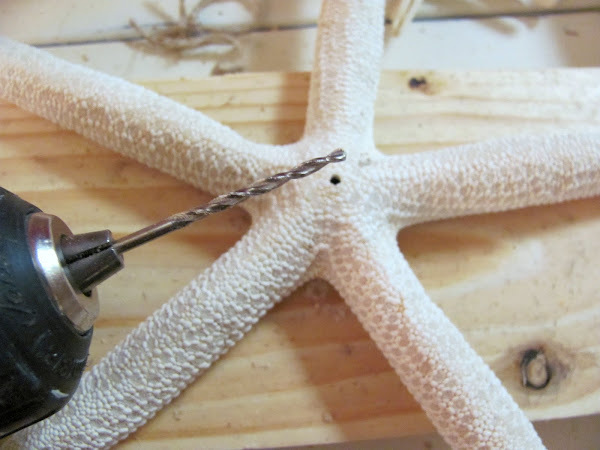 We then carefully drilled a hole in the center of a large starfish using a small drill bit and just eased it through the center of the starfish. 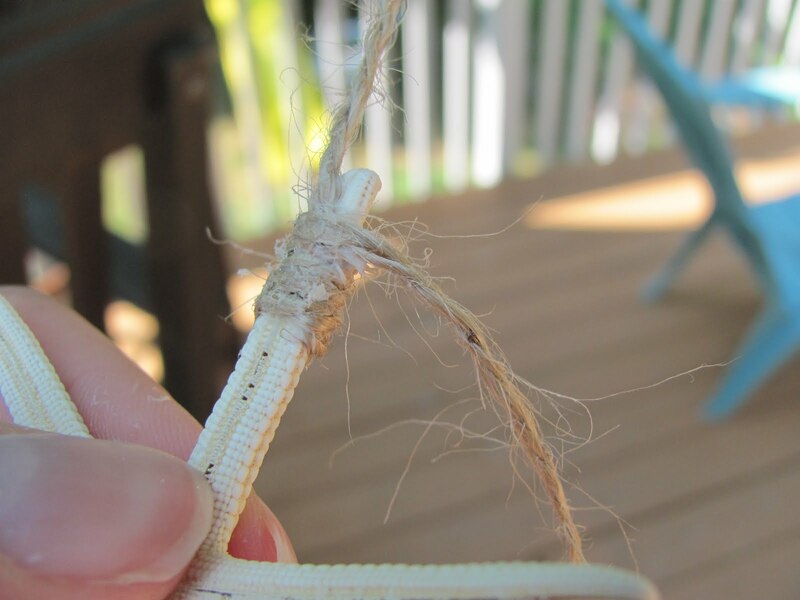 After threading the string through the starfish you can wrap it anyway you want and then tie it off underneath and tuck the string so the end doesn't show. 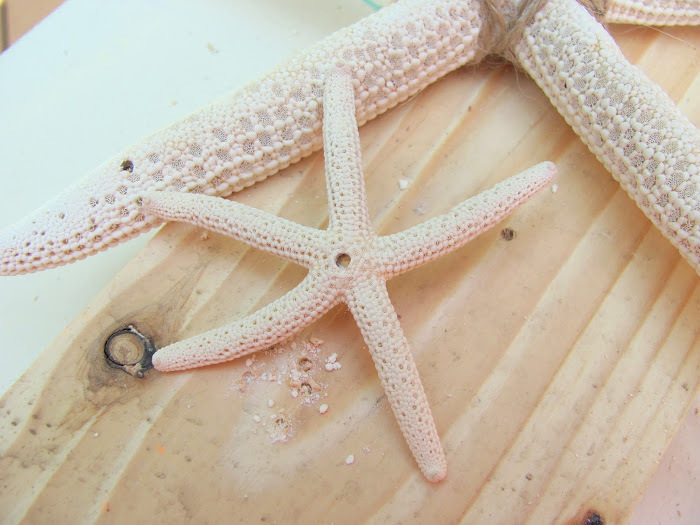 Now you want to drill holes on the tips of the starfish like this. Then thread individual strings through each hole and tie a little knot on top. 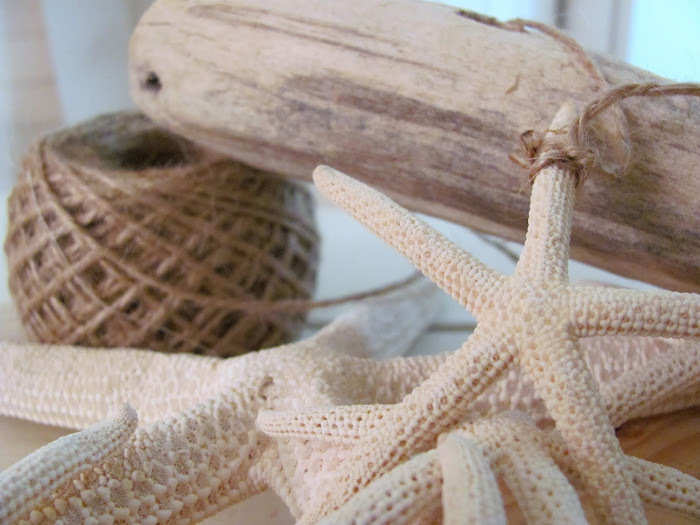 You can make the strings as long or as short as you want depending on where you want the smaller starfish to hang. 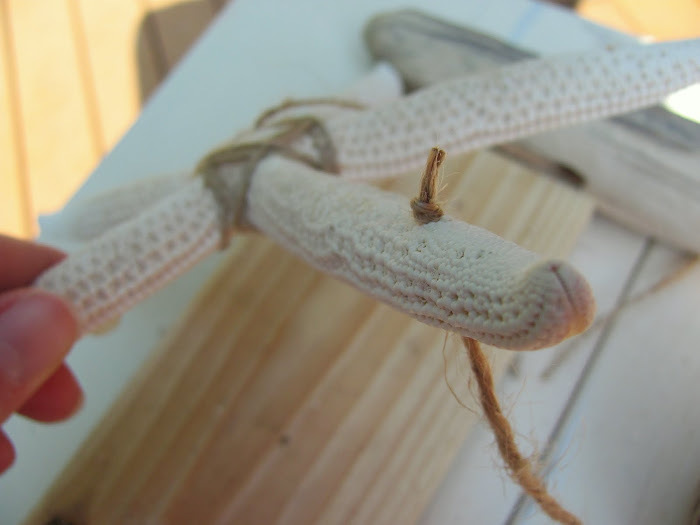 Then I again drilled a hole in the center of two of the smaller starfish and thread the two of the strings, which were opposite each other, into the holes and tied them off. 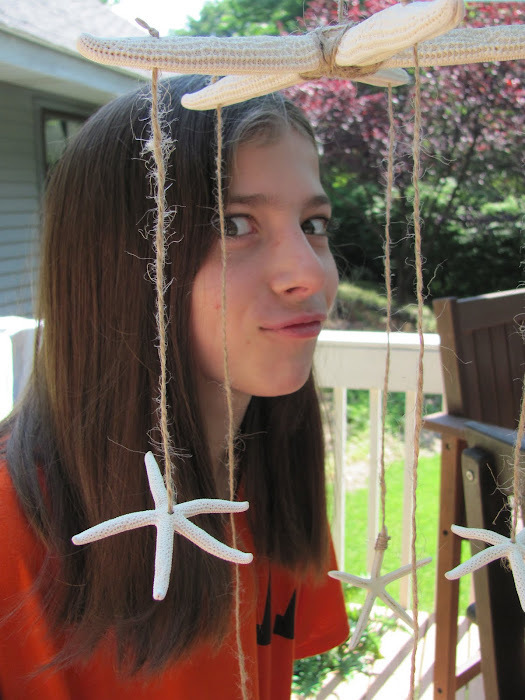 The remaining three starfish, my daughter wanted to tie onto the strings so they hung vertical. So I placed a small amount of glue (I used Elmers), then wrapped the end of the string around it and held it until it was able to stay on its own, about 2 minutes or so. 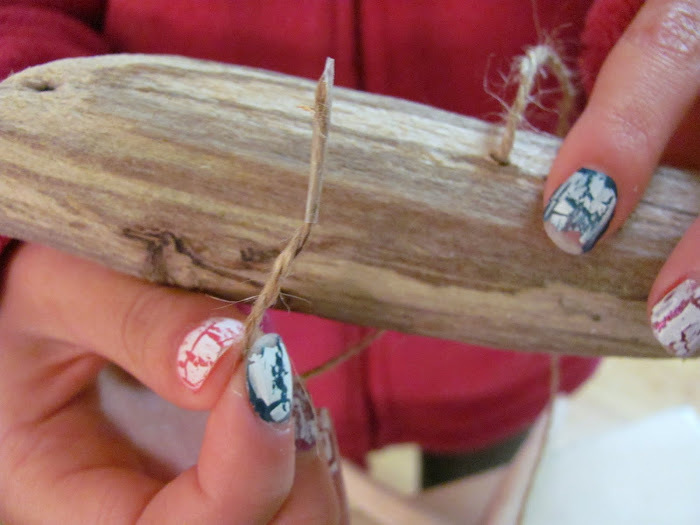 Again, you can make these as long or short as you want and just snip off any extra. 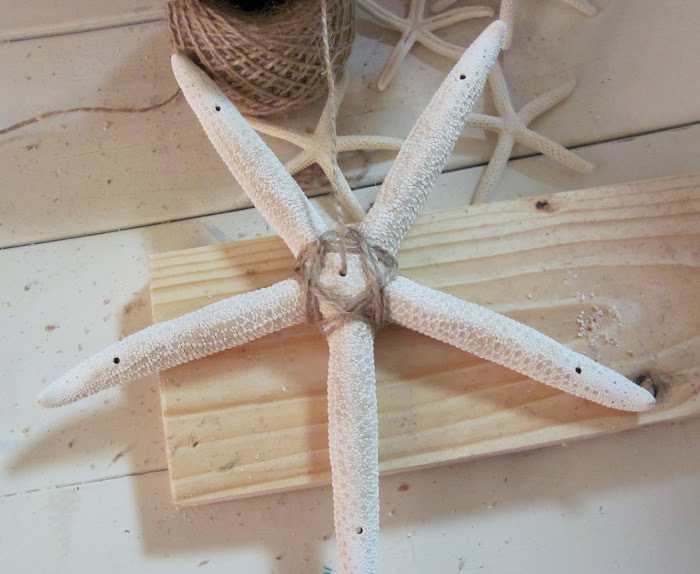 Repeat this for the remaining starfish and you get something that looks like this..
For the center you can use whatever you would like, another starfish, driftwood, nothing or a shell. Carefully drill a small hole in the top of the shell and tie off. 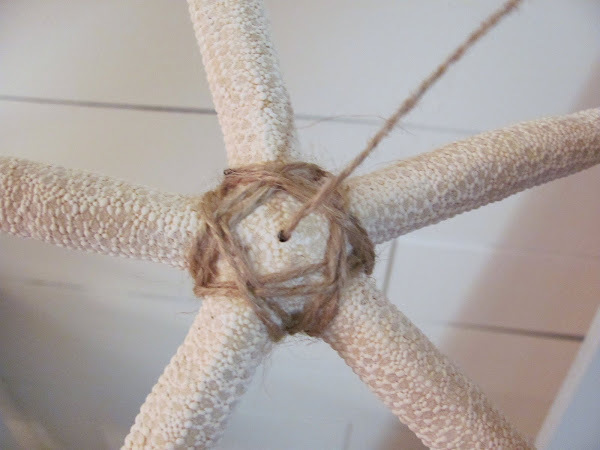 I did this using a separate piece of string and attached it to the center of the larger starfish by just tying it to the string that was already there. 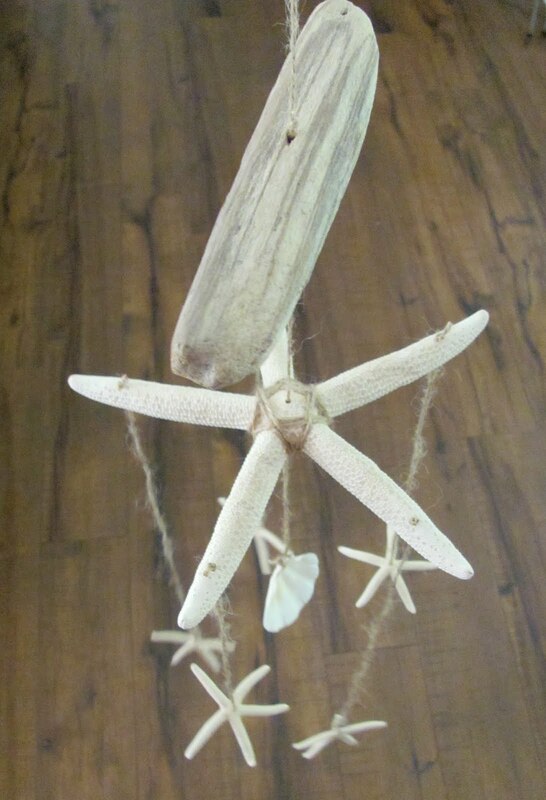 A cute little starfish and driftwood mobile! 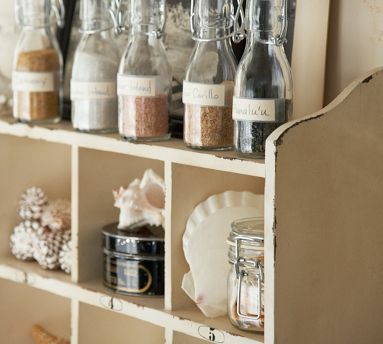 You can use anything you like, more sea shells or all driftwood, it is up to you! Thank you again Yanet, this was fun and I hope to be making some more of these soon!! 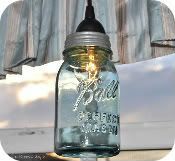 Thank YOU, Michelle, for sharing this terrific project with us. 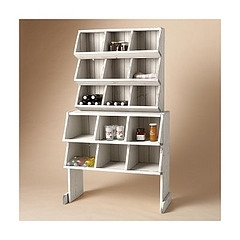 I can't wait to find some starfishes to put something like this together. Michelle is so sweet. I can e-mail my frustrations to her and she'll always have something encouraging to say. Even though we're thousands of miles apart, I feel like she's just a girlfriend next door. 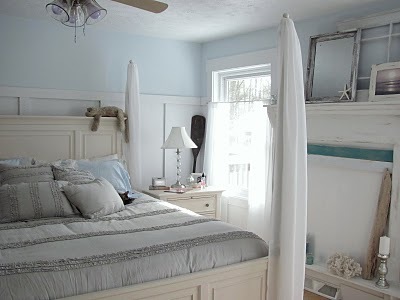 I can't let yall go without sending over to visit Michelle's Beachy Master Bedroom. 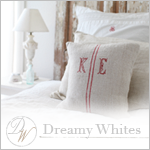 You might have seen it since it's been featured in several places in the blogosphere. If you haven't, you're in for a breath of fresh air. If you have, it's worth revisiting. 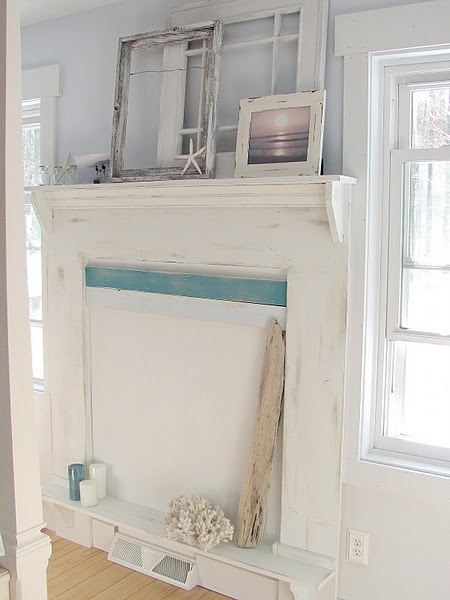 A favorite in Michelle's bedroom is the Faux Fireplace. 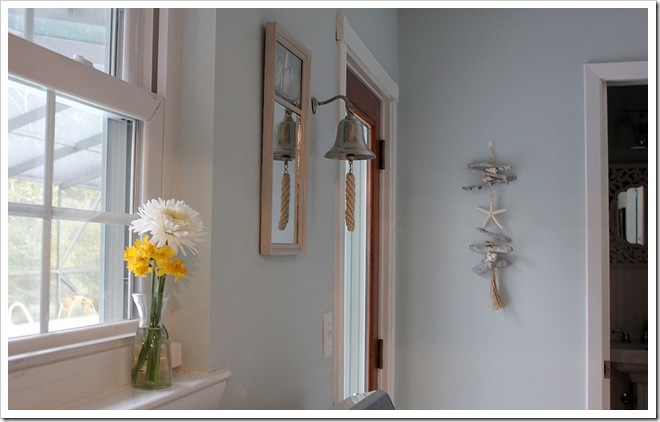 It looks like something out of Coastal Living Magazine, doesn't it? 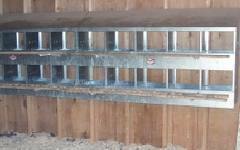 Come back tomorrow to see which Best Bloggy Friend makes hen's nest boxes look beautiful!